A new kind of thriving community requires a new way of creating the built environment—a way that is more attractive and durable and that provides the highest levels of energy efficiency, resource conservation, human health and comfort, and social responsibility. We think it should also be constructed using technology that makes it less expensive and faster to build, so that everyone can call this community home. Our building partner, Healthy Buildings, provides this foundation for our Thriving Communities. During 30 years of design, construction, operation, and maintenance, Healthy Buildings has pioneered a new way to build, using a proprietary healthy, beyond-green, and affordable building process called OTechnology. 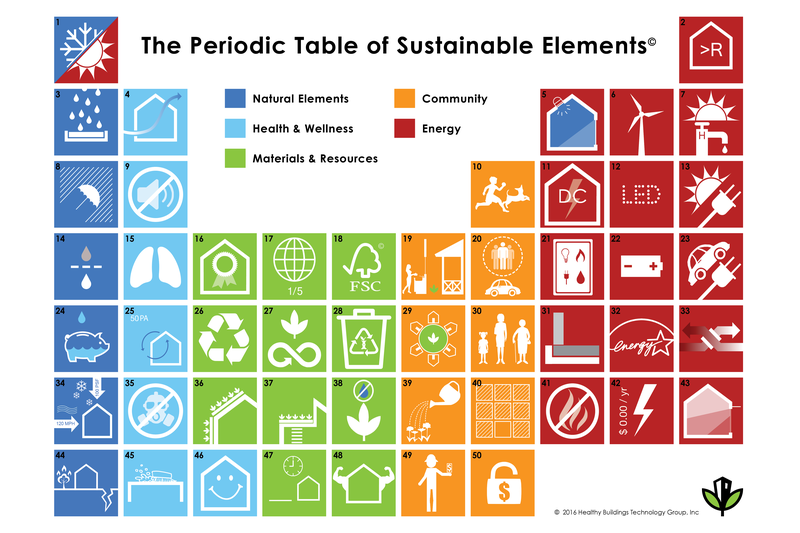 OTechnology incorporates up to 44 sustainable elements, shown on our Periodic Table of Sustainable Elements, that make our buildings sustainable and healthy. The OTechnology process focuses on energy-efficient and elegant design that capitalizes on passive techniques for natural light, ventilation, heating, and cooling—combined with the use of light-gauge, cold-formed, steel pre-constructed panels built specifically for OTechnology projects. The panels are made with high insulation and earth-friendly materials that won’t off gas and arrive ready for installation. This elegant combination of optimal systems and panelized construction results in high performance homes that are faster to build. Using this process, Healthy Buildings is able to save up to 50% in build time, creating more affordable, beyond-green homes that can already meet California’s 2020 energy efficiency standards requiring net-zero energy. Find out more about Healthy Buildings, our Thriving Communities design/build partner.